This release from Swiss producer D’Incise on the Zymogen netlabel is a little bit older, from August actually. But I have just downloaded it today and it is worth mentioning, I think. Are release dates important at all when talking about netaudio? Usually releases are available for many years, well as long as the files are hosted. No limited quantities, no sold out announcements. Actually that’s one of the advantages of netaudio. D’Incise covers a musical spectrum between Autechre and more leftfield Drum & Bass in the vein of Plug and Aphex Twin. If you want to get an idea what the seven tracks of this release are about just listen to the first two tracks: glitchy IDM sounds on Elle Dort and subbass driven breakbeats on Contemplatif et Pixellisé. The atmosphere on all tracks is kind of dark, though more comforting than sinister. If Autechre are on your playlist download this release. I guess you’ll like it. The man behind the ubiquitous D’Incise-moniker goes by the name of Laurent Peter and comes from Geneve, Switzerland. He’s part of the highly recommendable Diatribes free jazz-collective and runs his own netlabel for improvised music between jazz, noise and electronic music (check Insubordinations). With his EP for Filippo Aldovinis’ Zymogen-netlabel, you can catch D’Incise at his artistic peak level. ‘Elle Dort’ opens the EP. Laurent scatters his nervous beats over a classical Autechre-motive that unfolds itself in a beautiful, harmonic sub-layer including processed strings and flutes. ‘Contemplatif et Pixellisé’ features a great base-melody and surprises with aggressive yet ornate breakbeat-patterns. Woaw! Dark stuff. Short rest at ‘Anticipation d’un Voyage’. D’Incise quotes Autechre, once again, now at they’re abstract phase around ‘Confield’. Track number four is quite similar, adds some interesting sample-sounds and closes ranks to the breakbeat-influenced beginnings. At ‘Traumatisme Enfantin’, Laurent seems to improvise with his sound-vocabulary. It has to be mentioned because D’Incise shows off with some really interesting new tones that a lot of bedroom-producers should focus they’re mind on. ‘Spectacle’ is the most significant track of the whole EP. Laurent combines a strong, catchy melodic motive with a spoken word-sample, something about politics. The song works pretty well, although (because?) it’s the most obvious one on this recording. 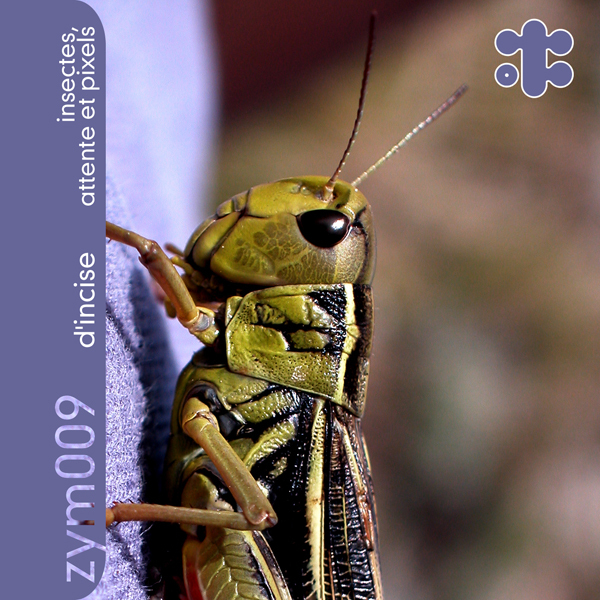 Last track ‘Insectes Diurnes et Nocturnes’ is a decent example to the D’Incise-sound, and you can learn an important lesson if you want to know about fresh IDM here. Again, the beats. Laurent uses a lot of different sampled sound for his complex rhythmic patterns. They don’t sound fat, but the do sound alive, diverse, like spread among the whole stereo-panorama. Bit like a box of stones- if you know how to shake. I noticed a certain slide to some darker sounds at Zymogen. ‘Insectes, Attente et Pixels’ suits this trend very well by drawing distinct influences from abstract drum n’ bass and late-nineties electronica. Autechre is a comparison you have to draw. But Booth and Brown are the ‘Fab Four’ of contemporary electronica, and which true pop band is ashamed if they’re compared with The Beatles? See. The outstanding feature of Laurents’ compositions is the dense mix of these ‘classical’ elements with a rich sound design that incorporates found sounds, elaborate synth-programmings and generative rumbling. Still, D’Incise keeps these influences in check: Beside all the Avant-Garde that probably stands in the back of Laurent Peter, D'Incise filters it by the means of the composition. That's awesome. 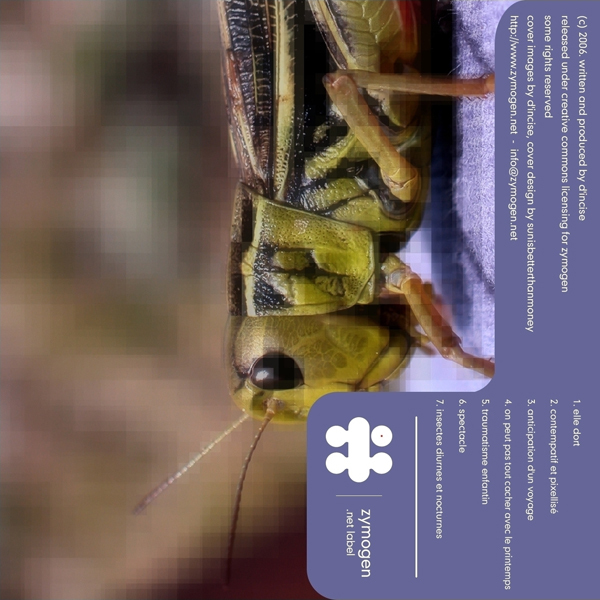 IDM and glitch are what makes Insectes, attente et pixels. In the first 3 tracks these components are more background elements giving an ambient and slower feel. On peut pas tout cacher avec le printemps brings the clicks'n'cuts to the front for a more aggressive sound, but near the end it gets slower again to make the appropriate mood for the following tracks. Spectacle is a little different with a spoken word opening and another kind of beats, breaking the routine of what preceeded as a syncop would to get back to it again but this time a lot more calmer with Insectes diurnes et nocturnes. Beautiful music. hell yeah! d'incise makes me believe in electronic again. i find it hard to get into most of the 'insubordinations'-stuff (his label for improv-music), but this EP is simply stunning. everything sounds edgy, handmade and very different from the electronic music you used to know. his beats are rumbling stones, more field-recoding than dance music. still it's quiete catchy and hypnotic. comparisons? zavoloka, gultskra artikler, normal music. you should know this. six stars. und wieder ein fantastisches meisterwerk auf zymogen. wie einige ja bereits bei kreislauf.fm # 17 gehört haben, bietet uns d'incise einen wunderbaren blick auf die welt der insekten. entspannte momente sorgen für eine wohlige stimmung, die man nicht mehr missen möchte. absolute download-empfehlung! Zymogen parte. No hay duda. En esta referencia nos demuestran su gran nivel de publicaciones y el excelente gusto que tienen. D'incise han elaborado un tabajo supremo, dónde cada sonido ha sido escogido y procesado meticulosamente llegando a conseguir una calidad casi perfecta, y digo casi por no querer ser tajante porque para mi es un trabajo perfecto. Límpio y con un gran sonido, un estilo entre la IDM y la indietrónica, con mucha electrónica y algunas referencias al pop.